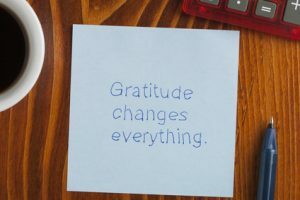 Being grateful can boost both your happiness and intuition big time. If you want more happiness, greater optimism about the world, feel more love from other people, and strengthen your intuition all you need to do is be grateful. Science has shown that you can experience these life improvements in just a week or two through gratitude exercises. We can start by saying, “Thank you.” But it’s more than just the words; it is what I call Positive Gratitude. Later, I’ll show you one of those gratitude exercises that is a powerful way to be grateful that has been scientifically proven to work. Being grateful helps you be more intuitive. Feelings of being grateful opens you up to the world where you’re less afraid and less worried. That openness and being positive are characteristics of your intuitive side. Your intuitive side will naturally become stronger when you are open and positive. 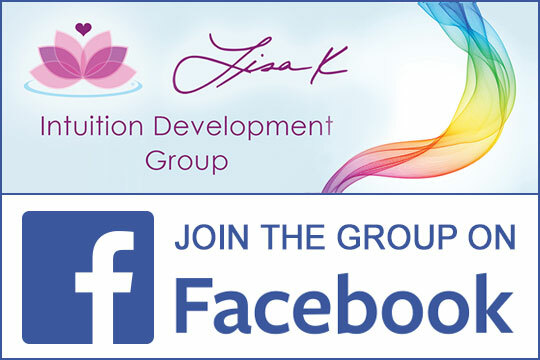 You’re going to connect more to your intuitive side by paying attention to those characteristics and experiencing them. When you’re grateful, you’ll find you are less critical of yourself and others, which is a super intuition boost because judgment is non-intuitive. As you worry less you’ll become more relaxed, more resilient and therefore open to the unexpected and that allows you to hear and feel your intuition more clearly. You can also be grateful for when your intuition was right and you followed it! Or even if you didn’t follow it, be grateful that it is working. Appreciation helps manifest your desires. Being grateful with Positive Gratitude, is an appreciation of what you have right now, about what you are experiencing right now or what you feel right now. Positive Gratitude is more than seeing the cup half full, it’s about feeling the appreciation that allows you to be enthusiastic, optimistic, joyful, and happy! Appreciation is the highest level on the emotional scale of being in alignment with, what Abraham-Hicks calls, Source Energy. According to the Law of Attraction, when you are in alignment with Source Energy you manifest what you desire more quickly. The best way to manifest is to move up the “Emotional Scale.” The lowest level emotion on the scale is fear, the highest level is appreciation. The lowest level emotion is the most OUT of alignment with Source Energy and the highest level emotion is the most IN alignment with Source Energy. When you are in alignment, you are connected to the divine flow of Source Energy. This means the higher you go on the scale, the easier it is for you to manifest good things in your life. You do this being grateful having the feeling of appreciation and joy. 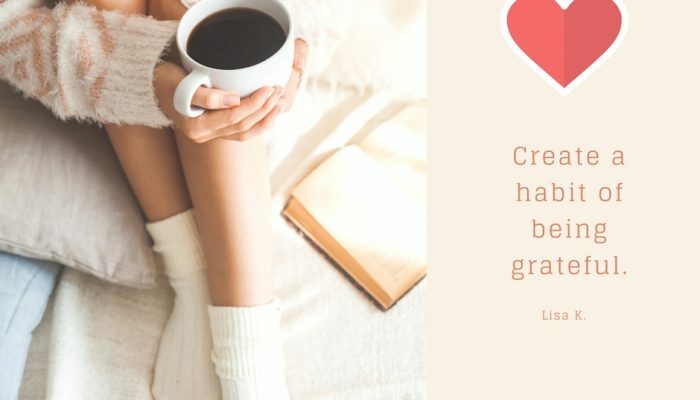 Scientific studies done by the University of California and the University of Miami show that keeping a daily gratitude journal of things you’re grateful for can, within a few weeks, significantly improve your happiness in daily life. To create your own daily gratitude journal, you can start by using a notebook, or if you’d like, you can buy a journal of blank paper. Pick a time during the day to write every day that’s convenient for you. You can also write at night before you go to sleep, so it gives you a chance to review the good things you are grateful for that happened during the day. You can list general things, like gratitude for your health, your family and friends, or you can list little things, like a beautiful sunset, or the wonderful meal you had at your favorite restaurant, or that good night’s sleep you had. It doesn’t matter what you list, as long as you list things that you feel good about and that make you happy. The feeling of appreciation and of goodness is key. Being thankful is “thinking about your blessings.” Remember, it is not about relief, “Oh Thank God that came just in time. Thank God that bad thing didn’t happen.” Focus on what you have now to be grateful for; it can be memories or what is happening in the moment. The more we recognize how many good things are around us, the more we realize that there is a flow of goodness and abundance that always comes to us. Try to write daily and the more you will notice the good in your life and you may find your attitude changing about life, that your life IS good. Write even if you only have a few things to write about. Later, you will find that your gratitude will come out during the day, not just when you sit down to write. Sometimes, it’s the little things that make all the difference in our lives. What are you grateful for? Here are three things on my list. I LOVE Technology, it’s my passion. With technology we can do so much. It’s like magic. Now can reach our loved ones, friends, family, cousins, co-workers almost anyone wherever they are in the world instantly. My husband travels all over the world but through cell phones, text messaging and the Internet, we are able to be in contact all the time. Do you remember the days when our phones were stuck to the wall in our house? If you wanted to contact someone you had to wait till they were near a phone or they sent you a letter in a paper envelope. Music. I love music, and it’s been around me since I was little because my mother is a professional singer. She’s done opera and musical theater, and I grew up with all kinds of music. Mom had me learn the piano at 5 years old, and then a few years later I started to play the violin, which I studied professionally when I was a teenager. Even though I switched to science and engineering, I always kept music in my life as an avocation. Now I sing like mom, but in a chorus. And I listen to a lot of music when I’m working. My friends and fans. I love you all, I love chatting, sharing our lives and going through this journey together. My happiest moments have been with others. Without people, I would be very sad, so I appreciate all of you connecting with me. That’s why I love hearing from you. Being grateful leads to more positive thinking and a better life. By being grateful and shifting our attitude about gratitude to it being a positive experience, we develop the awareness of goodness. By practicing being grateful we learn how to feel and experience the good in everything. Before you know it, you are living a better life because the positive abundance you seek is already there and more of it is coming. Being grateful leads us to positive thinking, which leads us to happiness, joy and a stronger intuition, and THAT can lead to enlightenment. As we practice being more grateful, we will manifest a more positive life, and if we all do that, then we can make the world a better place.